Motorcycle accidents in Georgia can be extremely serious. Because motorcyclists have little protection from cars, trucks, and other vehicles on the road, injuries sustained by motorcycle riders in accidents can be severe and even fatal. But even when a motorcyclist is clearly not at fault for an accident, he or she might find herself facing medical bills, lost wages from missing work, and even worse, drivers and insurance companies who'd rather point the finger at the motorcyclist than take a responsibility for their own actions. That's why it's so critical to find a motorcycle accident attorney you can trust. Each motorcycle accident is different. However, some motorcycle accident causes are more common than others. Most motorcycle accidents occur at intersections. While these types of accidents may lead to serious injuries and even fatalities, the most catastrophic injuries typically occur with motorcycle highway accidents. High speeds combined with larger vehicles often result in fatal motorcycle accidents. 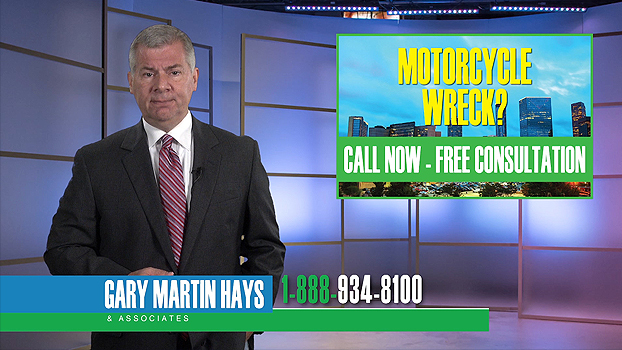 Gary Martin Hays & Associates encourages motorcycle riders to take precautions to reduce the chance of an accident and injury. Enroll in a motorcycle safety course. Always wear a helmet and require your passengers to wear helmets. Serious motorcycle accidents demand serious legal representation. Contact the experienced attorneys at Gary Martin Hays & Associates. We're ready to talk to you right away, and we won't charge you a dime until we win your case. Take action now. Call 1-800-898-HAYS for a free initial consultation with an experienced motorcycle accident lawyer.